Google Maps got an Uber upgrade that makes it clearer and easier to hail a car with your smartphone. Google Maps is making it easier to get an Uber headed uptown on Android and iOS. In the coming days, Android users will see a new tab in the Android app with ride-sharing information when searching for directions. The new functionality will roll out to iOS “very soon,” according to Google. The tab currently works in the United States and globally with Uber, as well as various companies in other countries, including 99Taxis (Brazil), Ola Cabs (India), Hailo (U.K. and Spain), mytaxi (Germany and Spain), and Gett (U.K.). Ride-share integration with Google Maps. 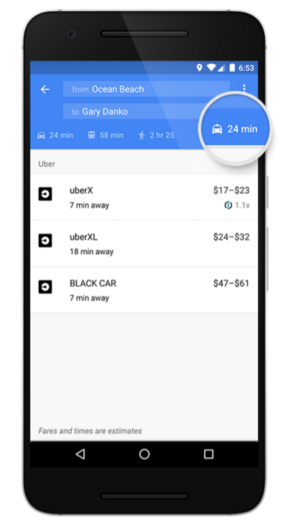 Google says you’ll also be able to see ride-sharing information as you do now under the walking and transit directions tabs “when it makes sense.” The actual ride-sharing information you’ll see includes options for various services. Uber information, for example, will include uberX, uberXL, and UberBlack for quick price comparisons in areas where all three options exist. If you have Uber installed on your phone you’ll also see fare estimates and pick up times when a car is available. Tap on the service you want and Maps will take you to the corresponding app to hail the car. The story behind the story: Ride-sharing services have been a big deal for a while now. If Google Maps wants to remain relevant to how people get around, it needs to tie into ride-sharing services. This new tab may also help Google in the future if users get in the habit of turning to Google Maps over multiple ride-sharing apps to figure out the cheapest way to get around. That could come in handy later if Waze Rider (formerly RideWith), the ride-sharing service currently being tested by Google-owned Waze, gets a wider release.